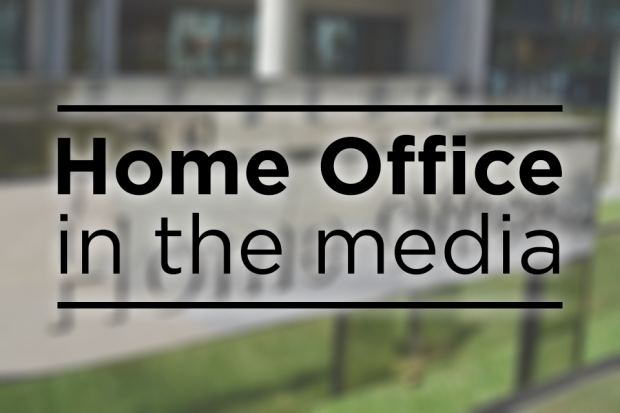 Today’s Home Office-related coverage includes a report by the Equality and Human Rights Commission (EHRC) into harassment at the workplace, Special Grant funding for the investigation into the disappearance of Madeline McCann and the release of the latest figures for the Channel Programme- part of the Government’s counter-radicalisation strategy, Prevent. The Telegraph, Independent, Metro, Financial Times, the Today programme and BBC online have all picked up a report by the Equality and Human Rights Commission (EHRC) into harassment at the workplace. The Telegraph leads on calls by the EHRC to ban non-disclosure agreements about sexual harassment in the workplace and for the Government to introduce legislation stopping employers from ignoring complaints to protect their reputation. The Today programme said that there should be a new code of practice on what businesses should do if there is a complaint. The Government response can be found below. This Government condemns all forms of workplace harassment, which is unlawful under the Equality Act. We are looking at all aspects of this wholly unacceptable behaviour, including the use of non-disclosure agreements. We welcome the EHRC’s input into the debate about sexual harassment. We believe existing laws provide protection for both men and women in the working environment; however, we will continue to keep the operation of the legislation under review, to ensure that it works as intended. The Express, Sun, Independent, Star, Mirror and Daily Mail all lead today on the Home Office announcement that the Government remains committed to the investigation, and that we have briefed the Metropolitan Police Service that its application for Special Grant funding will be granted to support the investigation into the disappearance of Madeleine McCann. The Mail states that detectives applied for more funding last month, and that Government funding has been granted every six months, with £154,000 being granted from October last year. Sky News, ITV News and BBC all state that police have been given more cash in the search efforts of Madeleine McCann, and speculate that more than £11 million has already been spent on the investigation. The Government remains committed to the investigation into the disappearance of Madeleine McCann (Operation Grange). We have briefed the MPS that its application for Special Grant funding for Operation Grange will be granted. Figures released by the Home Office today show that between April 2016 to March 2017, 6,093 individuals were referred to the Government’s counter-radicalistion Prevent programme and of those who received support from Channel, over a third were as a result of far-right concerns. The Prevent programme is fundamentally about protecting people who are vulnerable to all forms of radicalisation and has stopped hundreds of individuals being drawn towards terrorism and violence. The figures released today show that the programme is continuously improving, demonstrated by better referrals being made and the fact that we are tackling the threat from the far-right. We have seen all too starkly the devastating consequences of radicalisation and the need for a coordinated response at a local and national level. We will continue to work with partners to improve and make sure this crucial support is given to those who need it. The number of individuals referred to Prevent who went on to be discussed at the multi-agency Channel panel who examine whether an intervention is necessary, rose from 14% in 2015 to 2016 to 19% indicating better quality referrals are being made. The proportion of referrals which went on to receive Channel support also increased slightly. Channel is a voluntary, confidential programme which operates throughout England and Wales to safeguard people identified as vulnerable to being drawn into terrorism. It is a multi-agency process, involving partners from the local authority, the police, education, health providers, and others. Referring possible cases of early stage radicalisation works in a similar way to safeguarding processes designed to protect people from gang activity, drugs, and physical/sexual abuse. Participation in the Channel programme is voluntary and confidential. Many types of support are available, addressing educational, vocational, mental health, and other vulnerabilities. Ideological mentoring is common. The number of individuals referred to Prevent who went on to be discussed at the multi-agency Channel panel who examine whether an intervention is necessary, rose from 14% in 2015/16 to 19% in 2016/17 indicating increasingly better quality referrals are being made. Channel panels will only offer support where they consider that it is necessary and proportionate to do so. In 2016/17 29% of those discussed at a Channel panel went on to receive support from Channel demonstrating the process identifies genuine referrals. The number of Prevent referrals is very small compared to other forms of safeguarding. In 2016/17 6,093 individuals were referred to Prevent whereas approximately 646,000 children were referred to social services in the same period. Of these 38% resulted in no further action before or after assessment, similarly 36% of Prevent referrals required no further action. Channel addresses all forms of terrorism, including Islamist and far right wing. Just over a quarter of all people supported in 2015/16 were the result of far right concerns. This has risen to more than a third in 2016/17. The education sector is engaged and understands the Prevent duty as shown by the high level of engagement through education sector referrals. This is vital given the majority of those found to need support from Channel are under the age of 20. In 2015/16 a total of 7,631 individuals were referred to Prevent due to concerns they were vulnerable to terrorism. In 2016/17 6,093 were referred and of those 45 per cent were signposted to alternative support, 36 per cent required no further action and 19 per cent were discussed at Channel panels. Of those that received Channel support in 2016/17, 79 per cent left with their vulnerability successfully reduced. In 2016/17, 38 per cent of those receiving support on Channel was as a result of referrals from the education sector. Of individuals supported by Channel in 2016/17 68 per cent were aged 20 years or under and 87 per cent were male. Between 2012/13 and 2016/17 the number of people supported by Channel has more than doubled from 159 individuals to 332. Participation in Channel is voluntary and confidential and is not a criminal sanction. A referral can come from anyone who is concerned about a person they know who may be at risk of radicalisation, whether a family member, friend, colleague or from a wide range of partners: social services, children and adult services youth offending teams, health, police, education establishments, and places of worship and community organisations (through their normal safeguarding process). What happens to a referral? All referrals are carefully assessed by the police and the local authority to see if they are suitable for Channel or may require another intervention such as mental health support. If suitable, the case is discussed with all relevant partners at a Channel panel to decide if an intervention is necessary. Referred individuals are informed and must give consent (or via a parent or guardian if they are children) before an intervention can take place. How does a Channel panel work? The Channel panel is chaired by the local authority and works with multi‐agency partners to collectively assess the risk to an individual and decide whether an intervention is necessary. If a Channel intervention is required, the panel works with local partners to develop an appropriate tailored support package. The support package is monitored closely and reviewed regularly by the Channel panel. Who sits on a Channel panel? The Channel panel is chaired by the local authorities and can include a variety of statutory partners such as the police, children’s services, social services, education professionals and mental health care professionals. What kind of support is offered via Channel? The type of support available is wide-ranging, and can include help with education or career advice, dealing with mental or emotional health issues, drug/alcohol abuse, and theological or ideological mentoring from a Channel Intervention Provider (A specialist mentor).